Amibroker is a very powerful charting platform and you can generate sure shot intraday stock tips using this piece of software using some very simple scans and explorations. You can achieve almost 80% accuracy in your trading just by following simple methods. here in this post I will show you a live example. 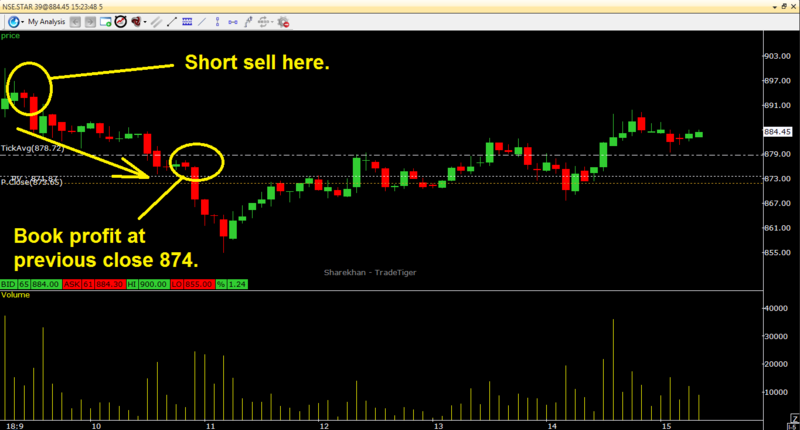 I will show you an example of 18th December 2012 where our subscribers have minted money short selling a stock. Rule of thumbs to generate sure shot intraday stock tips with Amibroker. 1) Identify a weak stock using simple scan. 2) Next morning wait for the stock to rally higher than by at least 1.5%-2.0% of previous close. 3) Short sell the stock. 4) Keep 1% stop loss. 5) Book profit if stock comes down to previous close. Now on 17th December, 2014 night we spotted a stock STAR, that has broken the trough with a high KRA of 48 and closed at 874. So, we kept STAR cash, future and options all on our screen. The next morning STAR opened up, gapped up, close to 900. So that is the ideal time to short it. So we shorted STAR around 900 with 1% SL, i.e. 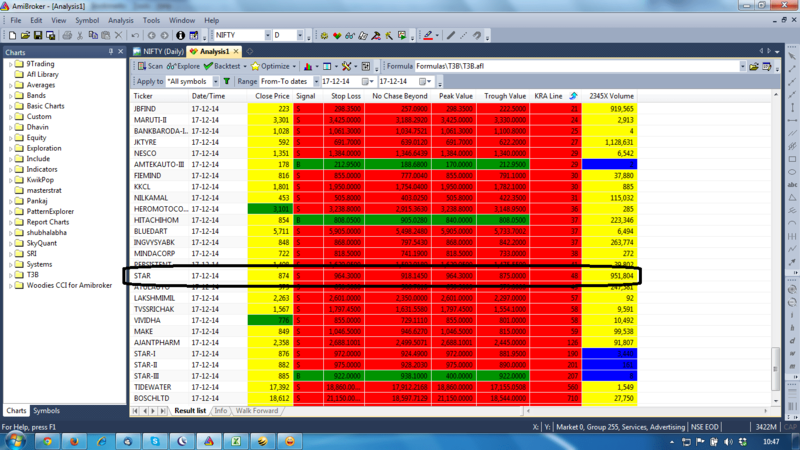 909 and booked profit at previous close level of 974. We got 26 points profit per lot, i.e Rs. 13000 per lot. Its a simple implementation of my 2% method to find sure shot intraday stock tips. For more info on scanning or finding scrips yourself please check here.